Not sure how this depicts Judgment? Click here. Etteilla: Judgment, Dedication, Power of Reasoning, Strong Belief, Decision, Deliberation. Lévi: In this hieroglyph, a genius sounds the trumpet and the dead rise from their tombs. These persons who are living and were dead, are a man, woman, and childthe triad of human life. Illustration (left): Judgment from Tarot de Marseille by Nicolas Conver (1761), re-published by Héron. Click on the image for a larger one. Christian: A man, a woman and a child, a collective symbol of the human trinity, are shown rising from this tomb. It is a sign of the change which is the end of all things, of Good as well as of Evil. Papus: A tomb opens in the earth, and a man, woman and child issue therefrom; their hands are joined in sign of adoration. How can the reawakening of nature under the influence of the Word be better expressed? Felkin: Man of himself is helpless. The impulse to ascend must come from above, but by its power he many transcend the sepulchre of environment and cast aside the trammel of desire. 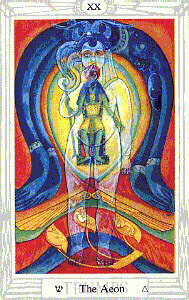 Waite: This is the card which registers the accomplishment of the great work of transformation in answer to the summons of the Supernalwhich summons is heard and answered from within. Wirth: Precious truths sleep in the tomb of oblivion. A faithful memory holds secretly what the wise ancients knew, so that all men may have their knowledge on the day of universal understanding. Then humanity will experience the reign of the Holy Spirit which will bring about religious unity based on the esotericism which is common to all religions. Case: This card implies completion, decision, termination. It is the final state of personal consciousness, which is on the verge of blending with the universal. 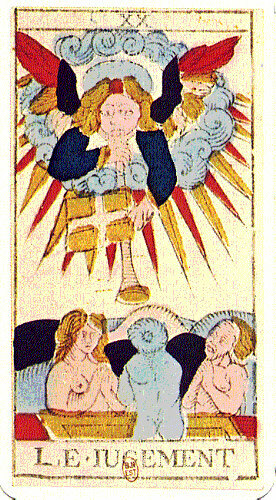 Crowley [who replaced Judgment with The Aeon]: The old card represented the destruction of the world by Fire. At the beginning, then of this new era, it is fit to exhibit the message of that angel who brought the news of the new Aeon to earth. 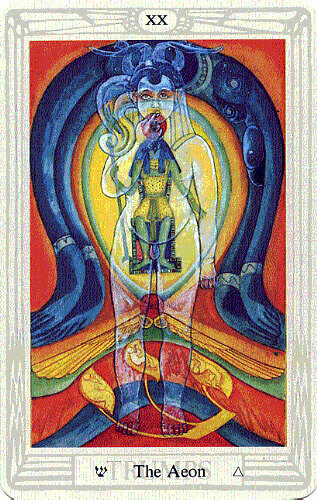 Illustration (left): The Aeon from The Thoth Tarot Deck designed by Aleister Crowley and painted by Lady Frieda Harris (copyright &COPY; 1944 Ordo Templi Orientis). Click the image for a larger one. Gray: Awakening, change of position, renewal. A change in personal consciousness, which is now on the verge of blending with the universal. Sadhu: To change, to transform ourselves, without end, but to change in an evolutionary way is our aim and motto. The end will come if only we can call the end that Reintegration, which means nothing less than our dissolution into the eternal Nirvana of the Unmanifested Perfection. ONeill: This card suggests the rise of the spirit back out of its prison, out of the grave and a call to higher things. All mystical traditions agree on the absolute necessity of this call. 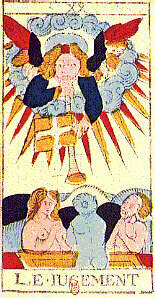 Of course, to the orthodox Christian, the card suggested the Last Judgment and the Resurrection of the Dead. Pollack: Judgment indicates not a change of circumstances but a new consiousness, one directly acquainted with the truth through a merging of yourself with the forces of life. Turk: Careful judgment by ones higher self leads to life everlasting; and everlasting self-judgment leads to a fulfilling life, since the idea of the Last Judgement is not intended to be some future and final event, but a part of the daily texture of our thoughts. Symbol (top): It depicts a trumpet which often comprises, in part, this Arcanum.